Holy Week is a special time for all Christians as we remember that God gave us the gift of an everlasting life through His son, Jesus Christ. This is a very difficult concept for each of us to understand. Even more difficult is learning the terrible truths of the crucifixion leading to the death of Jesus Christ. The children are taught their faith here at SWS, little by little, and year after year. This method helps children soak in all of the details so that they know God and know why we celebrate and ritualize so many things in our Catholic Christian faith. Fully understanding what we do makes each event fuller and richer giving us greater joy, trust, and hope for our own destiny in this life and beyond. The truth about Catholic Schools is that we “do” teach in the most awesome way. Celebrate – End of the School Year Party! Join our school community for a night out. Burgers, beverages and some great conversation are free. All Preschool – 8th grade parents are welcome! This wonderful party celebrates Catholic Schools in the Archdiocese. CSCOE is the organization that funds many of the SWS projects and initiatives. It is a great night out and a fundraiser for all of our Catholic Schools. It would be great to have a few parents and friends of SWS attend. A few of our staff members will be there! Join our table! Bring your good used or barely used shoes to the collection box outside the office April 24-May 8. Shoes are sold to support programs that feed the hungry in the Minneapolis-southwest suburban area. Please, donate shoes with no tears or holes and only minor scuffing or light wear and tear on the bottom. Tie laces together or bag pairs. Thank you! We are still collecting funds for the Smile Network. Pennies dimes, nickles and quarters are welcome. Notification for qualification – May 15. The Schulze Early Learning Scholarship is open to students entering the 4/5-year-old preK class next fall making them one year away from entering kindergarten. Fri., April 26 – 1st communion breakfast for grade 2 and their 6th grade buddies. Fri., May 3 – Family groups lunch and recess. Want to win $20,000 in cash? There will be 600 tickets sold for $100 each. 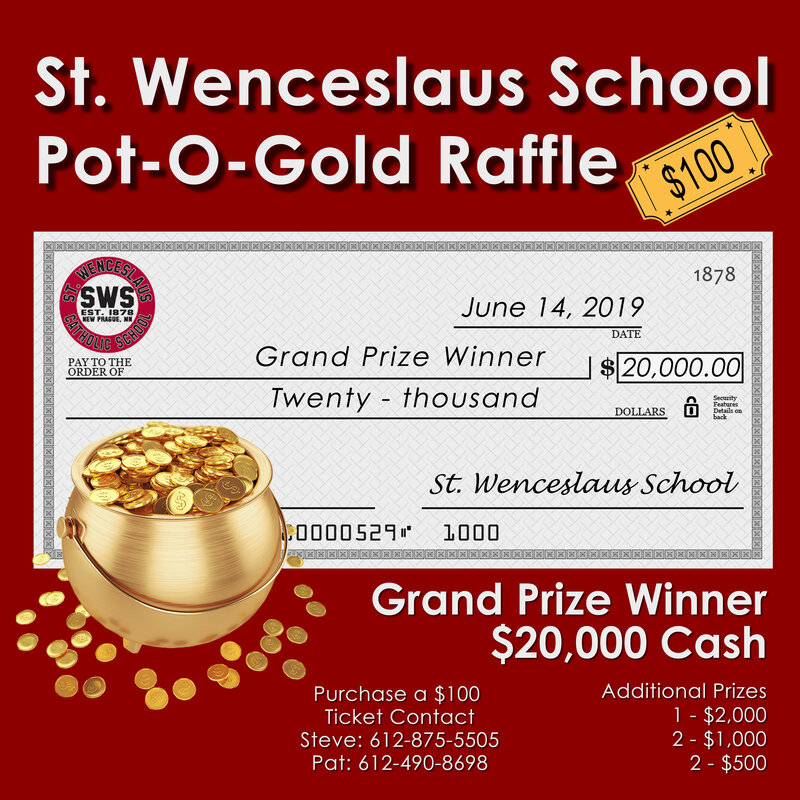 The winning raffle ticket will be drawn at the school golf tournament on June 14. If you want to buy a ticket or if you want to sell a few tickets to friends, contact the school office. Several smaller cash prizes are included in this raffle.